Basic Information- What is Hair-vit capsules? 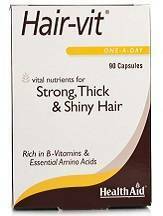 This review for Hair-vit capsules is to provide information to people who require supplements for growth of hair. Hair-vit capsules are rich in essential Amino Acids and B vitamins to promote hair growth and are suitable for both women and men. They help reduce hair loss caused by certain environmental and stress related factors. It is available on the product’s website as well as on other shopping websites. These capsules are meant for adults and for children above the age of sixteen. It is supposed to be taken once a day after breakfast. It is advised not to exceed the recommended dosage and consult a doctor before starting the supplement. The Hair-vit capsules come in two different packs which are available on the product’s website. One bottle contains 30 capsules which are priced at £9.99 per bottle and the other is 90 capsules which are priced at £25.99. These two options are available only on the product’s website. The other shopping websites are selling bottles containing 30 capsules at £9.63 and 90 capsules per bottle at £19.99. I have been taking these supplements for past one week and the difference can be seen in the reduction of hair fall and the texture of my hair seems to have improved. I will continue to use this product as it is working for me as well as being a supplement it has no side effects. The product comes with a warning that it contains iron and if excess of it is taken then it can cause harm to young children. It also states that it contains ingredients like soy and yeast which can cause allergic reactions in some people. It advises people to consult a doctor before starting on these supplements. Women who are pregnant or nursing mothers should first consult their doctors before using these supplements. There is no manufacturer’s commitment given on the product’s website so there is no warranty on the product given, there are no guarantees given on return or exchange policy on the product if the customer is not happy with it. There are a lot of positive customer reviews given on the product’s website as well as on other shopping websites which helps in promoting and selling this product but the downside remains the lack of warranty or commitment from the manufacturer’s end. Hair-vit capsules show a lot of promise given the good and positive customer reviews as well as since they are supplements there is no known side effects that can be caused by them. The downside only exists in the lack of warranty or return policy from the manufacturer’s side. The capsules are GMP certified and made by pharmaceuticals standards.